Cucina Testa Rossa: Of course I’ll work for free! Of course I’ll work for free! A quick explanation about how and with whom I initially came to France. Last June , an FCI alum who had just returned from Cannes stopped by cooking school to report back to the chefs. Chef Pascal, knowing I wanted to go to France, introduced me to him. I tucked this in the back of my mind and when it appeared on the job posting web site this past February , I immediately applied. The program in which I participated is sponsored by Kodak Film and a separate company called the American Pavilion in Los Angeles. The "American Pavilion" is the largest tent at the Cannes Film Festival and the closest one to the red carpet. It is the first in a row of tents sponsored by many different countries. 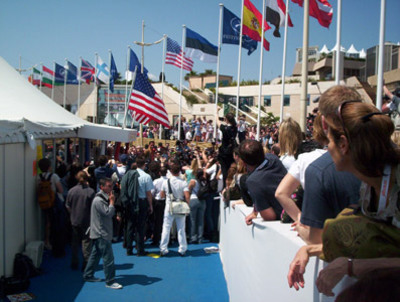 The American Pavilion tent has a kitchen, a dining area, a deck on the beach, an internet cafe, a business office, and separate press room where many of the producers and stars of the American films being shown would meet with the press. We were treated to the likes of Kevin Bacon & Kyra Sedgwick, Benjamin Bratt, Kevin Klein, Jim Cavazeil (The Passion), Billy Bob Thornton, and Roger Ebert who did many of his interviews there. The above photo is of Jim Cavaziel opening the American Pavilion. Kodak brings about 160 film students (who pay $2,000 each to be there!) from across the U.S. to work at various locations throughout the festival. Some worked as waiters at the Pavilion; some worked the market, La Marché, where film makers and producers were trying to sell to film distributors, which was what Michael Moore was trying to do with Fahrenheit 9/11. Some of the students have films that are being screened here but most are just trying to network and market the heck out of themselves. The AmPav started bringing in cooks about 8 years ago so that they could sell food in the tent.